Latest AP Postal MTS Syllabus 2019 is made available on this page. And the officials of the AP Postal Department had recently released the notification to fill Multi Tasking Staff Vacancies. And many people have applied for it. Most probably, the exam will be in the month of March 2019. At present, we assume that many of you are in deep search of the appost.in Exam Syllabus and also the AP Postal MTS Exam Pattern. Consequently, we have provided the suitable AP Postal MTS Selection Process, the subject wise AP Postal MTS Exam Syllabus topics on this page. Download AP పోస్టల్ శాఖ Test Syllabus 2019 in PDF format from the end of this page. The officials of the AP Postal Department are ready to hire suitable candidates for the Multi Tasking Staff posts. So, for that purpose, they have assigned a certain AP Postal MTS Selection Process 2019. Therefore, all the eligible candidates need to perform well in the Written Examination. So that you will be promoted for the next levels. cities viz., Kumool, Vijayawada (CRDA limits) and Visakhapatnam. The candidate should mention the order of preference for these three centers while registering the application through Online. Well, all the candidates can directly visit this section to get all the suitable information of the latest AP Postal MTS Exam Pattern 2019. Moreover, candidates shall be subjected to an Aptitude Test with a total of 100 marks of the level of 10th standard covering the following subject/ topics. The Aptitude Test is an objective type comprising of the following four parts. There is no negative marking for the written examination. with the condition as above. Collect a soft copy of AP Postal MTS Syllabus 2019 PDF along with the AP MTS Exam Pattern. 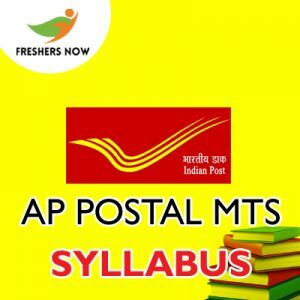 Revise all the concepts of the AP Postal MTS Syllabus 2019 with the help of study notes as provided on this page. Candidates while preparing for the AP Postal MTS Examination 2019, they need to know the clear appost.in Exam Syllabus 2019 along with test pattern. So, check out the entire page to get the accurate information. Furthermore, preparing with the AP Postal MTS Syllabus 2019 you can know the level of the test paper and the weightage of the sections. For the sake of the candidates, we have made the below listed topics for each subject required for the examination. Hope you all got the exact AP Postal MTS Syllabus 2019 information from the page. So, hit on the single link given above to get the entire subject wise appost.in Exam Syllabus. and follow us on our Freshers Now webportal to get all such latest Exam Syllabus, Previous Papers and many more.